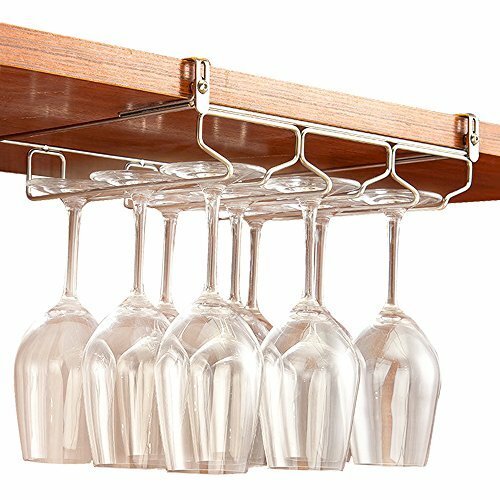 This stemware rack wine glass holder is a adjustable elegant under cabinet storage for bar or Kitchen. The stemware holder is made of high quality SUS 304 stainless steel. It's a durable, safe, convenient, upscale, beautiful decoration for home. This cabinet stemware rack is easy to install and removable. No drilling required to prevent any scratching or damage to your cabinets or cupboard. The stemware holder fit for 0.6"-1.6" cabinet. Thickness can be adjusted with enclosed hex wrench. Just tight with the Knobs. If you have any questions about this product by GeLive, contact us by completing and submitting the form below. If you are looking for a specif part number, please include it with your message.